My Monthly Update – It’s NaNoWriMo Time! November 2014 – NaNoWriMo starts today! I am writing a Contemporary Romance Novel titled – A New Season. If you’re doing NaNoWriMo, add me as your buddy. I am signed up as Sydliyah. I will also be taking a blog break for the month of November to concentrate on NaNo, but you can find my daily updates under the Sydney Writes Tab. 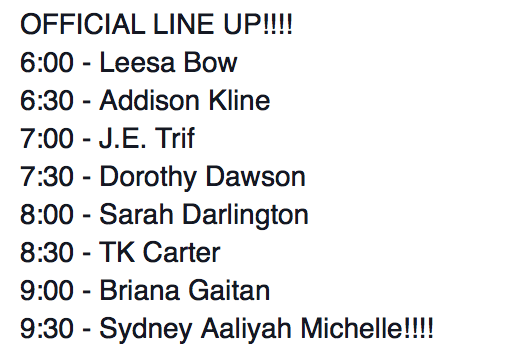 November 16th, 2014 – Literary Fall Ball w/Sydney Aaliyah. I’m throwing a ball, a Facebook Party Ball. I have a lot of cool authors doing take overs and we will be giving away lost of awesome stuff. Check out the details, here. Complete first draft of A New Season – 70,000 words. The trailer for Marvel’s Avengers: Age of Ultron is out and it is soooooo gooooood!!!! Have you added Hope for Him to your TBR list? What are you writing for NaNoWriMo? Would you like to come to my Literary Fall Ball?